Really enjoyed getting to know the staff on the barge. This made the biking (which I found somewhat challenging) to be a more memorable experience. As a result, I would do this type of trip again. My most memorable part of cycling along the Rhine River was seeing the beautiful country side hills with castles and fortresses and stopping for coffee and delicious baked goods in villages. The boat was great and we all got the cabins we were hoping for – the food was really good. The girls commented that they weren’t expecting the food to be as good as it was. •	The biking was as easy as we expected, I didn’t like the bikes as much as the bikes we had on the Danube the year before but the bikes were exactly what they said on the web-site. Pretty well all the trails were paved – makes it hard to come back to PEI trails! •	Apparently we weren’t on as pretty a section of the Rhine as we could have been but we saw some great scenery and little villages were so clean, friendly and relatively easy to get around. The crew said they didn’t like this route because it wasn’t as scenic and not as many places to stop. Apparently, they are not going to do the same route next year. •	I don’t think the tour itself was quite as well run as the one on MV Story on Danube IN 2014. I didn’t think the tour guide this year gave nearly as good instructions as the previous year and often it was difficult to figure out exactly which trail to take. The book with maps had a number of errors but guy said that would be fixed. I think they were some translations errors as well.. Last year, the tour guide always biked the route (he would wait until boat left so was always behind us and we knew he’d catch up). This guy said he was always behind us but we only saw him once and very briefly. He didn’t give suggestions of places to eat etc like they did last year. We always found good spots so that was not an issue but not because he provided suggestions. In 2014 the directions were very very clear and the company put arrows on the sign posts to show the directions. That was very helpful but non of that happened this year 2015. Maybe if they had continued the tour they would have done that as well. •	The directions we got for where the boat was docked in Basel were wrong – the directions said to go to West side and that was where the boat was always docked!! Well, it wasn’t there it was on the east side. Thankfully when it wasn’t where it was expected to be, the cab driver knew where it “probably” was. We did NOT feel the cabby took advantage of us as a few other couples has same issue and one of them had taken a bus to the dock!!. Tripsite was very responsive when we explained this and you were very generous in reimbursing us for cab fares (should have been 21 E per cab but was 54E per cab). I saw the meter and he only charged us what the meter said, plus he turned meter off a couple of times. We did give him tip. We took 2 cabs for the 6 of us and they followed each other so we all had same issue. •	We would absolutely go on another Tripsite trip and we all had a great time – just wanted to give you the feedback. If asked, I would recommend the Danube over this section of the Rhine. I would however try a different section of the Rhine and we may look at Holland another year. The guide was not well prepared with maps and the boat kept changing docking locations. The Rhine is very industrial from Basel to Mainz. The rides were not very interesting or long. It was not one of your better offers. I was pleased with the points of interest on the tour (Strasbourg, Heidelberg, Colmar, Breisach), however, the route was very industrial at times and there was just nothing special about it. The maps and route descriptions were terrible and I'd say that was the number one complaint of fellow passengers. I talked to the guide and he said they will redo the route for next year so hopefully with some changes, it will be much better. The boat itself is nothing remarkable, but quite comfortable and clean. The staff was amazingly friendly. Route descriptions were sparse in some sections so there was some guessing involved. The maps themselves didn't have any road names on them if you did get lost they were of no use. We honestly didn't rely on the maps/route descriptions as much as the info from our daily meetings with the tour guide. There were good and bad days as far as scenery on the rides, a few days were pretty boring with not a lot to look at, while others were quite beautiful. We docked within walking distance to town on all days except one (where you had the option of one lonely restaurant). On board you are provided with maps and flyers for each overnight town. The bikes were super heavy and cumbersome (not bikes I am used to) but this is the norm in Europe. The food on board was excellent. I would recommend this trip as I know the routes are being reviewed and descriptions/maps updated. Garrit, our bike tour leader, was a novice on this route as well as a poor communicator to the english speaking clients. The docking area changed at each stop from the printed instructions, and the maps and turn-by-turn instructions were only partly correct! Everyone got lost at some point in the trip!! I had asked for GPS routing for my bike Garmin GPS but was told the route was to new and that it was not available! I think some accurate preparation would have made the trip more pleasant. Second - the route along the Rhine is not scenic (as on the Danube) with few small towns to stop and look/snack on the way. The most notable sights were gravel pits and cement manufacturing. Of course, that is not the fault of the tour operator, however, they should have provided a detailed description of the small towns on the way (although not on the river) to give us the option of exploring the interesting ones and forgetting about the towns with 3 streets and no interesting sights. Boat staff need to learn how to be more polite and friendly. The management seems to be in the military service. The Rhine from Mainz to Basel, for the most part, is industrial and not as picturesque as other European bike and barge routes we've enjoyed. There were a few cities (Heidelberg, Germany and Strausbourg, France) which were beautiful and offered much to do, but we were expecting the scenic bike routes with quaint towns for cake and coffee, or beer stops along the way and were sorely disappointed. But the most disappointing aspect of this trip was the inability of the on-board guide to give proper instructions nor enlighten us of things to see or visit. We found out about popular sites from all channels except the guides. In Strausbourg, while chatting with tourists, we heard of an amazing evening light show projected onto an enormous cathedral - huge crowds gathered to enjoy this historic presentation, yet nothing was mentioned of it by our guide. We have needed so little guidance to enjoy our bike and barge trips, but this one missed the mark. Based on previous trips that we've done, we'd convinced 2 other couples to join us and they were underwhelmed and disappointed as well. The barge and accommodations were adequate, though rooms were random sizes no matter which deck you choose. One couple paid extra for the upper deck, but their room was much smaller than another couple's on the lower level. 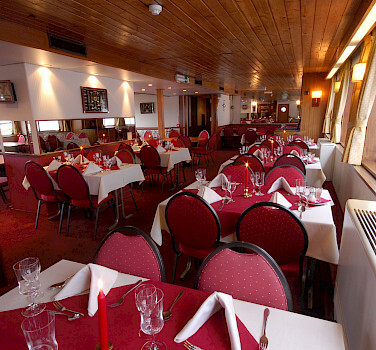 The staff and meals on this barge were top notch and we can't say enough about the gourmet chef and tireless staff. interesting people. I would love to do a different bike/boat tour at some time in the future.